What is this and what do I do to it? This seems to look after itself OK at the front of my house but is starting to look untidy. Firstly I'd like to know what it is, but also when and how do I keep it under control? This is a Helleborus, when it has finished flowering, cut off the flower stems as these can become heavy and cause stems to collapse, to tidy this plant up, it does not mind if you just pluck out the leaves if they are too big or have become slightly discoloured. I have a couple of these in my borders and they do cover ground quite quickly. 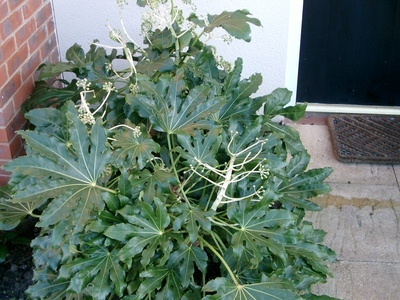 Hi Peter, this plant is a Fatsia Japonica, also known as Japanese Aralia. I live in Japan where this is native and is called "Yatsude", meaning 8 fingers. It flowers in the winter and can be trimmed at any time. It is easy to maintain and grows well even in the shade.Feel free to prune it as it will grow back! Jackie is wrong ,it is definitelyNot Helleborus,it is Fatsia Japonica. hello. I think it is Fatsia Japonica. I have one in the woodland area of my garden under trees which , when it got huge, I just cut it back. It was fine so give it a go. I hope this helps you. garden in a Huge Pot.....Its growing away lovely, enjoying itself.